Shipping Glass Around the World! The idea of delivering or shipping glass in any form strikes terror into the heart of most people. However, with the best packaging systems and careful planning, it is possible to ship anything, anywhere safely. We have undertaken stained glass window installations in Japan. We have had to get leaded panels there in one piece, so that it can be fitted immediately without repair requirements or embarrasment! We have also shipped stained glass windows, completed for our customers with destinations including Singapore and France. 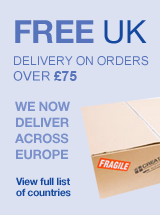 We have developed a shipping method and service which we can offer to you. We even insure the glass, for extra piece of mind. Our special packaging method means that the glass travels safely and arrives in pristine condition. There is minimal risk of damage from poor handling. We have developed this through the work in Japan but also with Creative Glass Guild's day to day delivery service. Our online shop handles thousands of orders each year, which we must fulfil and deliver across the UK, Ireland, Europe and the World! The development that we have done since 2005 with specialist carriers and packaging companies, means that we are confident in our abilities.